Explore the past when you visit these history museums in Pennsylvania. 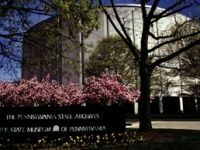 You'll love seeing artifacts, reading old documents and experiencing exhibits that tell about the past in these history museums PA has to offer. One of the Most Visited Pennsylvania History Museums! The State Museum of Pennsylvania is adjacent to PA's State Capitol Building in Harrisburg, and offers a variety of exhibits and exquisite collections that showcase the state's thoroughly fascinating heritage. Explore the history of Native Americans in PA, the colonial and revolutionary origins, and a Civil War battleground that'll take you through the vast industrial age. For all you art enthusiasts, The Fine Art of Giving is a splendid exhibition of 85 paintings, sculptures, photographs, prints, and crafts that were selected from more than 400 gifts of art received between the years of 1998 and 2008. Trailblazers is another great exhibit, which educates its visitors on notable African-Americans throughout PA history. The State Museum of PA also offers several educational programs that allow students of all ages to learn about the state's textured history. With 135,000 schoolchildren and adults who visit annually, the museum has more visitors than any other historic museum in PA between Pittsburgh and Pennsylvania! A Fascinating Museum in Central PA! 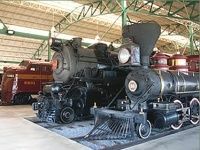 The Railroad Museum of Pennsylvania is home to an intriguing collection of historic railroad artifacts. The museum's mission is to preserve and interpret the massive impact of railroad development in our society. See over 100 locomotives and cars from the mid- 19th and 20th centuries. Many of these unique artifacts have been restored to their original appearance. You can even step inside real historic locomotives and train cars. Your kids will probably enjoy the highly detailed model train displays. In addition to railroad artifacts, you will find priceless art work, books, and photographs. The museum offers educational programs for students of all ages, as well as tours and special events. When you're done journeying through the history of Pennsylvania's railroad system, sit down to a nice dinner at the Red Caboose Restaurant. The Whistle Stop Gift Shop contains a wide selection of train-themed souvenirs including toys, books, posters, pins, shirts, and others. One of the Best Historic Museums in Pittsburgh! The Carnegie Museum of Natural History in Pittsburgh is a haven for specimens and artifacts that will better educate you on the history of life on earth. Regarded as one of the best natural history museums in America, there are many mesmerizing exhibits to explore. One of them is the Hall of North American Wildlife, which features some of the country’s most amazing animals (i.e. : endangered jaguar, white-tailed deer). Alcoa Foundation Hall of American Indians gives insight into Native American cultures and their relationships with the natural world. You can journey back into the pre-historic era with Dinosaurs in Their Time, one of the world’s largest dinosaur displays! It shows dinosaurs in scientifically accurate poses amidst plant and animal species that shared their environments. A trip to Pittsburgh is not complete without a visit to this amazing natural history museum in PA! Explore the Most Extensive Collection of Artifacts! 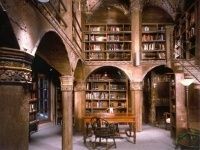 At the Mercer & Fonthill Museums in Doylestown, you could experience castles full of treasures. The Pennsylvania history museums offer programs, events, exhibits, and tours that will entertain people of all ages. The mission of these museums is to instill an appreciation and knowledge of one's past. For example, at the Spruance Library, you can discover your family history. Established in 1897, the Mercer Museum is recognized as having the most extensive collections of artifacts relating to pre-1850 American ways and technological history. The Fonthill Museum is founder Henry Mercer's concrete castle house. Inside you will find 44 rooms, 18 fireplaces, and over 200 windows. A tour of this building will give you a clear vision of Mercer's one-of-a-kind architectural and artistic vision. The Fonthill Museum alone attracts over 30,000 visitors from virtually every state and over 35 foreign countries. One of the Best Museums to Visit in Pennsylvania! Are you a big fan of classic films? 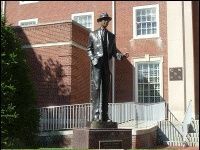 Come visit the Jimmy Stewart Museum, which is situated in the classic film actor's birthplace of Indiana, PA. Throughout Jimmy Stewart's vast film career, he has entertained and inspired moviegoers from all over the globe. The museum highlights Stewart's accomplishments on the silver screen, as well as on TV and radio. View film clips and retrospectives in the 1930's vintage movie theater, which now contains state-of-the-art sound and projection technology. From the museum's windows, you can view the bronze statue that was dedicated to Stewart on his 75th birthday and the old courthouse clock which was made famous by Life magazine's famous back-from-World War II photograph. You will also find ample displays of original movie posters and photos dating back to the 1930's. The list of special museum features includes a performance by famed Jimmy Stewart impersonator Chris Collins. One of the Largest History Museums in PA! The Senator John Heinz History Center is one of the largest history museums in Western PA at a whopping 275,000 sq.feet. This museum features six floors of changing exhibits. Located in Pittsburgh's historic Strip District, which is known for its amazing retail food markets, unique shops, ethnic restaurants, and lively nightclubs. The Library & Archives,which is located on the History Center's sixth floor, is open from 10 a.m. to 5 p.m., Wednesday through Saturday. All other hours are by appointment. Admission starts at $10 for adults and $9 for senior citizens(62+). Children from 4-17 are $5. 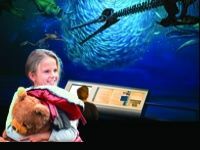 Ages 3 and under are FREE and so are history center members. An Insightful Museum about African American History! 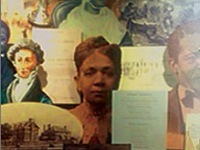 As a mecca for preserving African American art and artifacts, the African American Museum in Philadelphia offers powerful insight into the history and stories of America Americans. Committed to telling the story of American Americans, this historical museum in Philadelphia presents exhibits focusing on the Civil Rights Movement, arts and entertainment, medicine, sports, architecture, religion, politics, and law. Focusing on the history of slavery and how the African American culture has evolved to what it is today, the African American Museum in Philadelphia provides insightful information that will leave you inspired and enlightened. Don't miss out on their many great events and programs - go to their website to take a look at what's coming up! Gain Some Philadelphia History Knowledge! As a museum dedicated to Philadelphia's rich past, the Philadelphia History Museum has been entertaining children and adults for years. 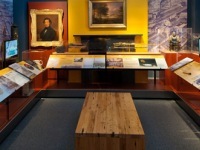 With exhibitions that invite visitors to explore more than 300 years in Philadelphia's past, this Philly history museum has city stories, portraits of famous Philadelphians, objects and artifacts, and Phillies Fandemonium. Not only do they have exhibits, but they also offer public programs and events. Presenting a full schedule of concerts, lectures, presentations and others programs, the Philadelphia History Museum encourages you to obtain hands-on involvement in Philadelphia history. Also, check out their website for a variety of free events that take place at the Philadelphia History Museum! Experience a unique kind of Philadelphia history - experience the horror and history of the Eastern State Penitentiary! Once the most famous and expensive prison in the world, Eastern State Penitentiary now remains a museum that presents beautiful architecture, and a haunting representation of the building's past. 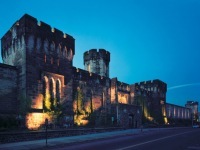 Once the home of many of America's most notorious criminals, including Al Capone and "Slick Willie" Sutton, Eastern State Penitentiary not only shows you an up-close and hands-on view of the prison, but also offers historic backgrounds. If you're a thrill seeker, then check out the museum's "Terror Behind the Walls" haunted house inside the prison. Both spooky and historical, this Philadelphia history museum is sure to entertain! Artifacts and Objects from Historic Germantown! 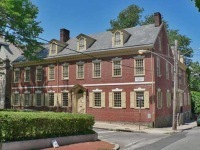 Dedicated to preserving and interpreting the history of the original German Township in Philadelphia, the Germantown Historical Society Museum is the home of a large collection of artifacts, books, maps, manuscripts, images, and more. This history museum in Philadelphia includes a variety of domestic objects such as silver, furniture, pottery, porcelain, kitchenware, tableware, needlework, kid's toys and games, and more. This Philadelphia historical museum provides a clear picture of what life was like in Germantown many years ago. Come by and check it out on Tuesdays and Thursdays, and gain some knowledge about historical Philadelphia! Exhibits Dedicated to Inspirational American Heroes! 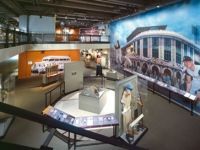 Dedicated to educating and preserving the ideas of freedom and democracy, the National Liberty Museum presents a variety of exhibits that showcase the strong men and women that have guided America toward freedom. With 78 exhibits and 178 works of contemporary art, you can spend all day walking through this museum, and you will enjoy every minute of it! Check out their many inspirational exhibits, including the Let Freedom Ring gallery, the Coming to America Gallery, the Inspiration Exhibit, the Heroes of 9/11 Memorial, and much more. From a Martin Luther King exhibit to a 9/11 heroes exhibit, you are sure to walk out of this museum with a sense of inspirational and pride for this country.